Hospitals, ambulatory care centers and physician clinics are undergoing a digital transformation, integrating their EHR platforms with new patient engagement systems and emerging precision health platforms. 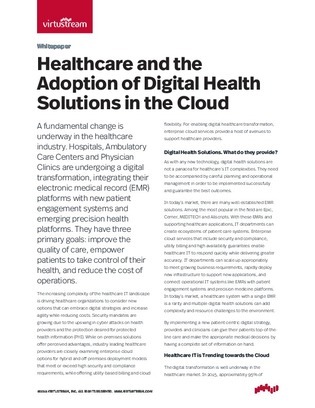 In this white paper, learn about implementing a new patient-centric digital strategy, and the impact of accelerating cloud adoption in health IT. Take a look inside to uncover how security and compliance are driving managed cloud deployments, concerns about the managed cloud, why hybrid is the way for healthcare IT, and more.